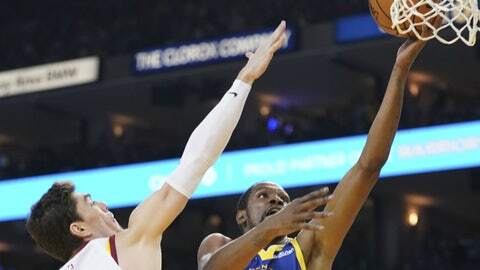 OAKLAND, Calif. (AP) — Draymond Green had 20 points and eight rebounds, Kevin Durant added 15 points and eight assists, and Quinn Cook scored 14 to help the Warriors (55-24) inch closer to clinching the Western Conference in their second-to-last regular season game at Oracle Arena. With 16,283 points Curry trails only Wilt Chamberlain (17,783) and Rick Barry (16,447) on the Warriors career scoring charts. The Warriors need one more win or a Denver loss to secure the top spot and home court advantage in the West. Curry is a big reason why Golden State is back on top despite a sometimes tumultuous season. The two-time MVP made 9 of 12 3s and had seven assists in the wire-to-wire win, the Warriors ninth consecutive over the Cavaliers. Larry Nance Jr. scored seven points as part of a 12-4 run. Then, Sexton scored on a 3-pointer and reverse layup to pull the Cavs within three point at 115-112. Curry made four 3s in the first quarter and had a four-point play to help Golden State get off to a fast start. Green presented Nick Young with his championship ring from last season during a ceremony before the game. Cavaliers: Brandon Knight was called for a technical foul in the third quarter. … Thompson returned to the lineup after getting a day off Thursday in Sacramento. … Matthew Dellavedova remains in concussion protocol. Warriors: Klay Thompson scored 11 points and went 1 of 7 on 3s. … DeMarcus Cousins (load management) and Andre Igoudala (sore left toe) were held out.